Hi, I'm Nicky, Head Stylist here at VictoriaPlum.com. 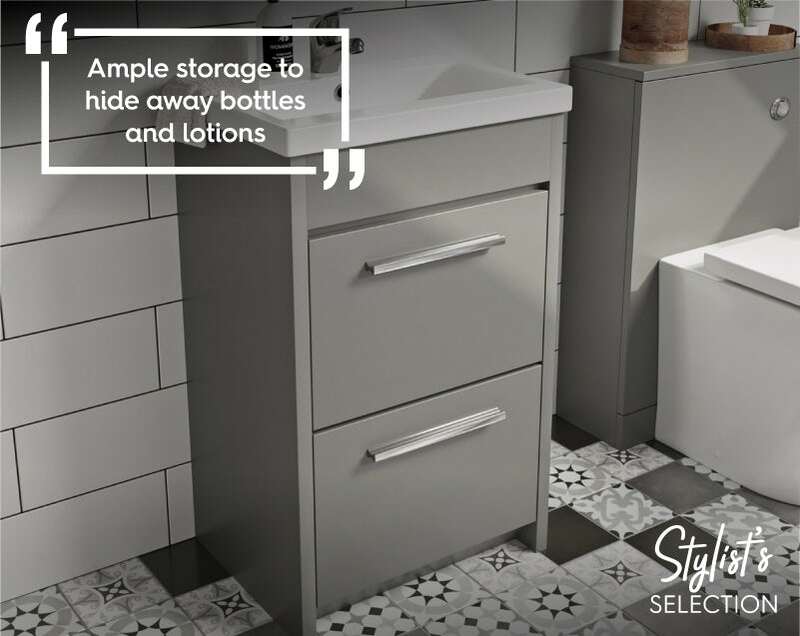 Each month, I pick out some of my favourite products, to help you create a bathroom that looks sophisticated, stylish and very much on-trend. This month I've decided to create a fresh and thoughtful scheme. With January not far away, it won't be long before we begin contemplating all those New Year’s resolutions, so what better way to inspire you, than with a thought-provoking and mindful bathroom space? Check out my mood board below. December’s theme is all about neutral interiors with a sense of minimalism. Featuring soft greys, pearlescent finishes and muted tones, this is a look for someone who appreciates the simple things in life. Practicality hasn’t gone amiss either. With an LED mirror for a perfect reflection and a Cool Touch thermostatic shower, a relaxing and functional space is easily within your grasp. 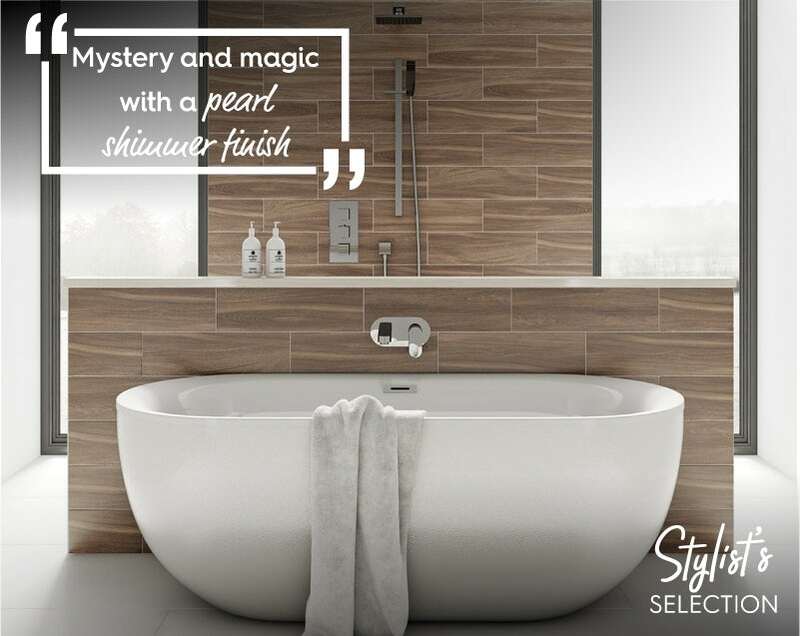 I’ve chosen the Mode Ellis pearl freestanding bath this month for its designer style and simple shape. The inviting pearl shimmer finish has a sense of mystery and magic. Pair with a sleek wall mounted tap or a freestanding filler tap and your bathroom will look stylish in no time. 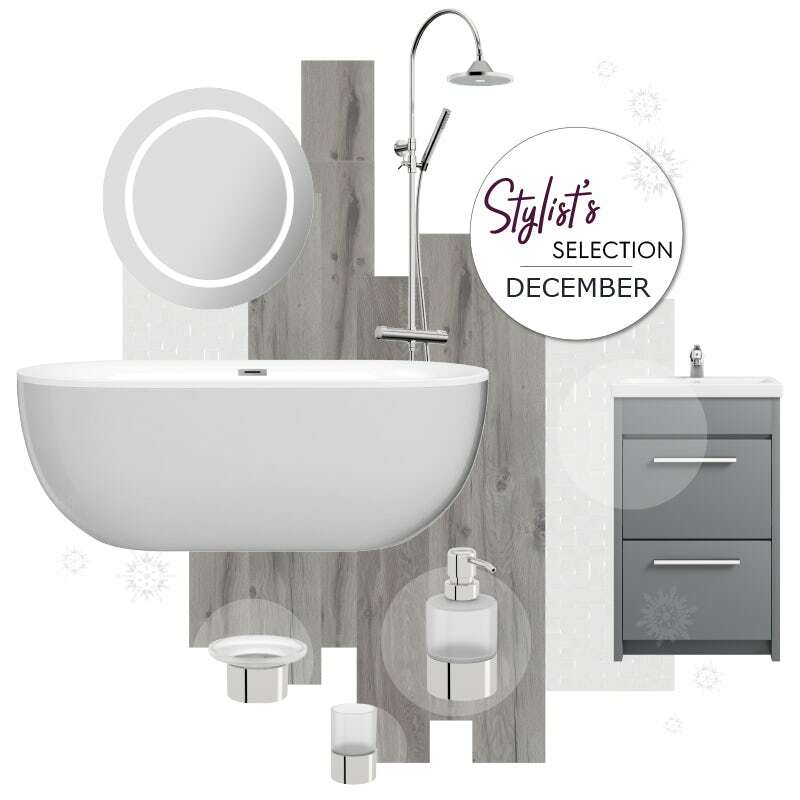 My vanity of choice this month is the Clarity satin grey, as it works seamlessly with the Mode Ellis pearl bath. Boasting ample storage, it features a beautiful, minimalistic design—perfect for your mindful retreat. So hide away all those bottles and get relaxing! No-one wants a space that looks or feels cold. One way to add warmth to a bathroom with little colour is through texture. That’s why I've selected the Krono xonic Keaton vinyl flooring. 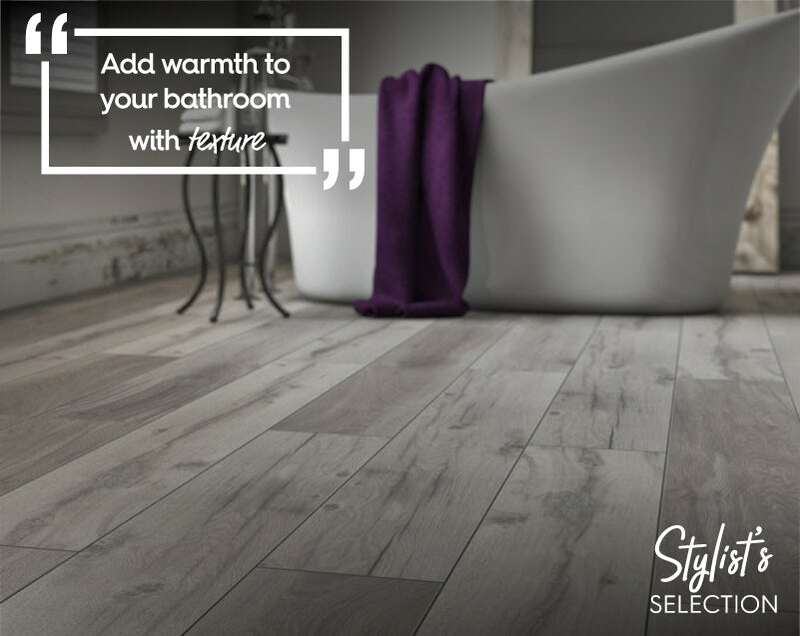 With lovely wood-effect texture but subtle saturation, it’s the perfect compromise and adds that much-needed boost to otherwise flat surfaces. Why not add some white tiles to this look for a cleaner finish? Instead of going for a flat design, I’ve decided to add more character by choosing the Studio Conran hartland white pressed mosaic gloss tiles. 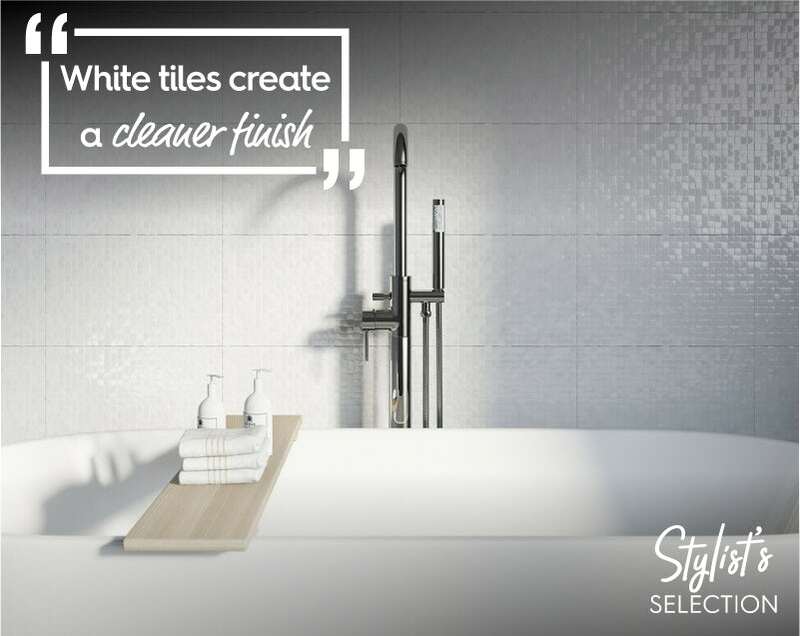 With a range of angles, these tiles reflect light around the room, adding an interesting feature and a touch of personality. This look has a subtle high-tech and futuristic feel. Therefore, my shower of choice is the Mode Cool Touch round thermostatic exposed mixer shower. 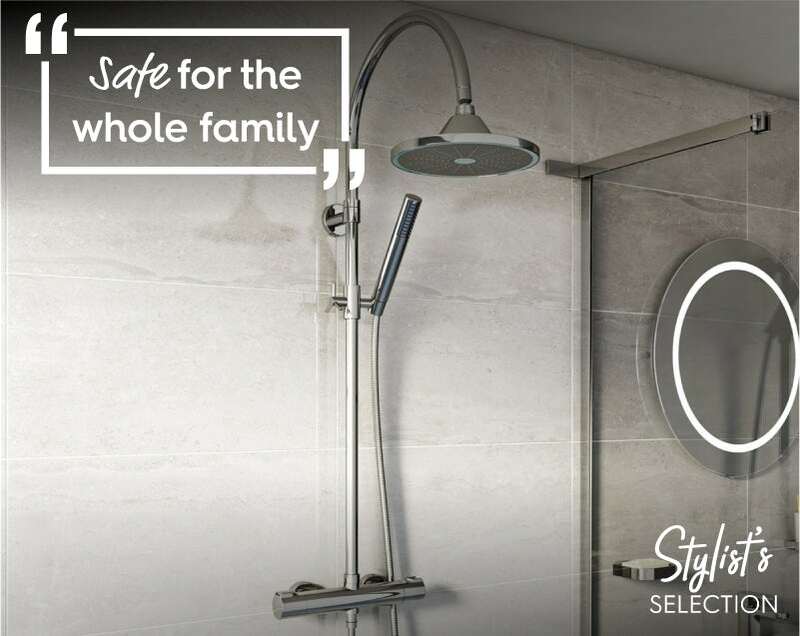 Featuring an LED shower head that shows you when the water temperature is just right, there will be no nasty shocks when using this shower and, combined with a cut out safety feature, it helps to prevent accidental burns and scalds, meaning it's safe for the whole family to use. 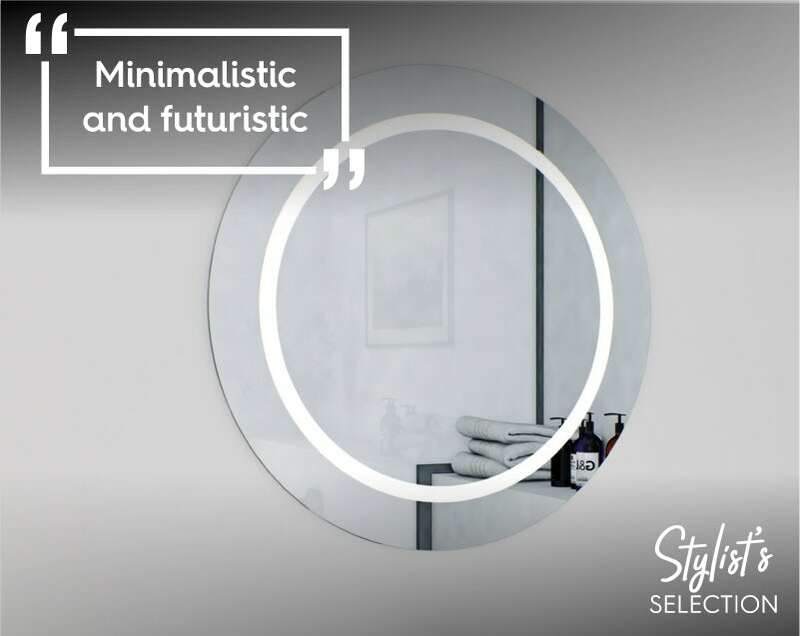 The final touch to this minimalistic, futuristic and mindful space is the Mode Shine round LED mirror with demister. The circular shape adds a softer look and the LED light is perfect for applying makeup. The demister is super practical after a hot shower—it’s an all-round great product. Why not take a look back through some of my previous Stylist's Selections? You're bound to find a theme you like for your new bathroom.